Technology has enabled a number of innovative financial technologies that provide advantages to the consumer – Bitcoin with its anonymity and ability to transfer funds without exchange fees, mobile check deposits supported by most major banks, peer-to-peer lending such as Prosper and The Lending Club offer, and the list goes on. Recently I received an email from Credit Sesame advertising Vouch – a lender that gives one loans based on one’s network. In the past if you wanted to secure a loan but didn’t have a good credit history (or a history at all) you needed to find someone to co-sign on the loan (or pay exorbitantly high interest rates). The danger in co-signing is that one essentially places one’s own well-being in the hands of another. If that other person defaults on the loan for any reason – you become responsible to pay it. In this life there are few things we are truly in control of – part of the wisdom of life is recognizing what we can and cannot control. Vouching unwisely is something we can choose not to do. Now vouch is a similar concept to co-signing, it just distributes the risk. Whereas previously if someone borrowed $5000 and you co-signed you would be liable for the entire $5000, with vouch you choose a level of liability – $25, $100, $500, etc. Assuming you vouch only what is within your means to easily repay, the risk becomes fairly low. Most people can afford $25 out-of-pocket as a one-time expense, if necessary. 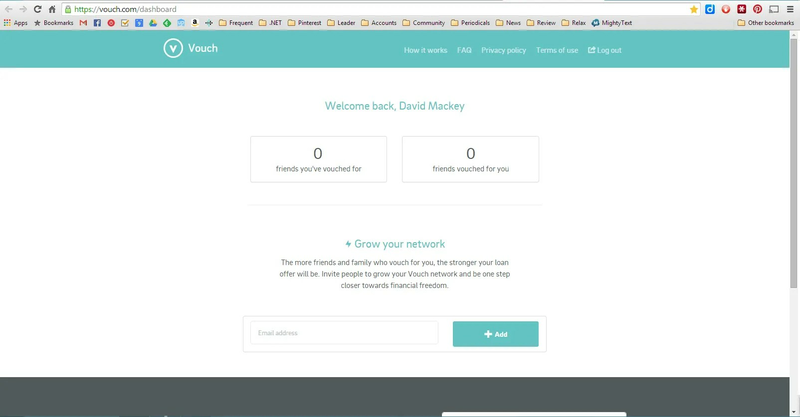 The idea behind vouch is to offer lower rates by essentially having numerous co-signers on a loan. I know they like the term vouch – its less scary than co-sign, but imho, it is co-signing, just distributed. This idea is pretty spiffy, if you ask me (ohh, you didn’t? well, I guess I’ll just tell you anyways! ), because it could open loans to a demographic (those with poor/no credit history) at affordable rates where there has traditionally been reasonable option available. P2P is great if you have a good credit score – but it isn’t worth a hoot if you recently went through bankruptcy, a recession, etc. John lost his job in 2008 in the recession, over the next several years he built up $25,000 in credit card debt and his credit score declined as he had to sometimes delay paying a credit card bill to ensure his electric wasn’t turned off. At the moment he is paying 20% interest on this debt. He has recently secured a new job which pays well, has good benefits, and historically John has always been a faithful, hard worker – but his credit history is still horrible. John gets a number of friends and relatives to vouch (co-sign) $25-$100 for him and is able to refinance a significant amount of his debt through Vouch at 10% interest. Mary is heading off to college but needs an additional $2,000 to pay for her first semester. She has already taken available of all the grants and scholarships available and also the reasonably priced student loans. She now has a choice between taking out a loan from a lender who will charge her high interest due to her lack of a credit history, or she could use Vouch to allow a number of family members (parents, grandparents, aunts and uncles) to co-sign with her. Since her family knows she is responsible, they don’t mind “promising” to pay up $100 each if Mary should fail to meet her obligations. They know that Mary will not fail excluding some extraordinary circumstances. This also makes sense for the lender. The lender is spreading their risk out. With a traditional co-sign loan one can pursue those who have signed the loan (say two to four people) to get back one’s money, but if these individuals are unable to pay, the lender is out of luck. Whereas with a system like Vouch one can spread the risk across dozens or hundreds of people – and statistically it is less likely that all will be unable/unwilling to pay (especially since it is a smaller amount) which means there is less risk for the lender of losing their investment. This is a screenshot of the dashboard one is presented with after registering on the site. I have not used Vouch, I just think it is a neat idea. I’ve setup an account, it was fairly easy, and am waiting for them to reply to me with info. about what I would qualify for…and whether Vouch ends up being a great business or not, the solution is fairly ingenious and I hope it will take off. Next story Height-Adjustable Desks (aka Site/Stand Desks) – 2014 Update. Previous story Toshiba, Kingston, and the Case of Useless RAM.